I wish there was still some of this cake in the kitchen. Sadly, it’s long gone. Lee and his sister polished it off with ice cream on Monday night. Oh I got my share. I tasted the sticky corners of the pan after I first inverted the cake onto a plate. I had a nice, big slice the night after our second triathlon. It was exactly what I needed and I was so glad I’d baked the day before. 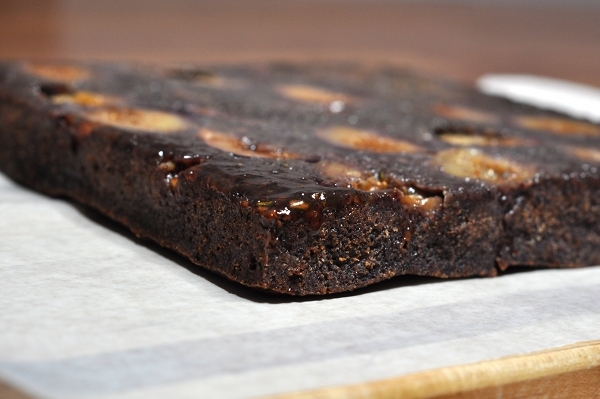 This is the best thing I’ve baked for a long time: it’s fruity, herby, sweet and nutty without being overpowering. It’s dense but still dessert. I made this for the figs. They practically begged me to do it. I have this problem with figs, you see. When the short-but-sweet fig season finally gets going I have to buy them. I buy them en masse and then remember that I’m the only one in this household that actually likes figs. I vaguely remember giving Lee one once, long ago, and having him say “Is this supposed to taste good?” Ha! So, we have figs. Then there’s the rosemary and cornmeal, and not just any cornmeal but purple cornmeal. 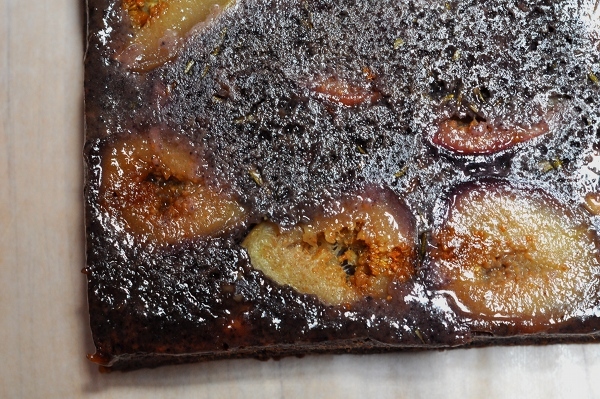 I came across this recipe (the second one) while searching for an upside-down fig cake and the thought of rosemary and walnuts with my gooey fruit was captivating. I also happen to have fresh rosemary from the CSA box in my fridge and walnuts in my pantry. This kind of ingredient alignment almost never happens to me! I used rosemary and walnuts from the above recipe but found my cornmeal inspiration from Cake Duchess and her Peach and Cornmeal Upside-Down Cake. I almost recruited the peaches from my fruit drawer at the sight of this beauty and went right for the purple cornmeal I’d bought for some other grand plan a while back. I should have taken a picture while I was mixing the batter. The purple color was incredibly intense. It darkened as the cake baked but I still like the dark purple notes in the finished product. Wouldn’t a yellow and purple swirl be fun? Even though it may seem like the butter-sugar concoction you’re coating your pan with is going to cook itself into a stuck-on mess it really isn’t. Everything is going to be fine. Butter is magical, even in reasonable quantities. Don’t invert your upside down cake out of the pan until you’re ready to serve it. I couldn’t wait to see mine to I flipped it as soon as it had cooled and I think the glossy topping soaked into the cake by the time I sliced it the next day. It might have soaked in even if I’d left the cake upside down but I’m guessing it would hold up better. I lied! I learned 3 things! Make a cake with cornmeal and fruit and you can eat it for breakfast without feeling like you’re eating cake for breakfast! 1 cup cornmeal, preferably stone ground but only purple if you feel like it. Yellow would be lovely too. 3/4 cup flour of choice. I used barley flour. Turn the oven on to 350 degrees F.
Place butter in a square or circular cake pan or a 10 inch cast-iron skillet and place this in the oven for a few minutes till the butter has melted. When the butter is melted, add 1/4 cup brown sugar and stir to combine and evenly distribute the mixture. Place halved figs on top of the sugar/butter layer cut side down so that they cover at least most of the bottom of the pan. Sprinkled rosemary and walnuts over between figs. Set the pan aside. In a medium bowl, sift/whisk together cornmeal, flour, baking powder, and salt. In the bowl of a stand mixer or by hand, beat coconut oil and remaining brown sugar until well blended. Add eggs to the oil+sugar. Reduce mixer speed to medium, if using, and beat well. Mix in milk, applesauce, and vanilla. Slowly add dry ingredients to wet, mixing on low until just combined. 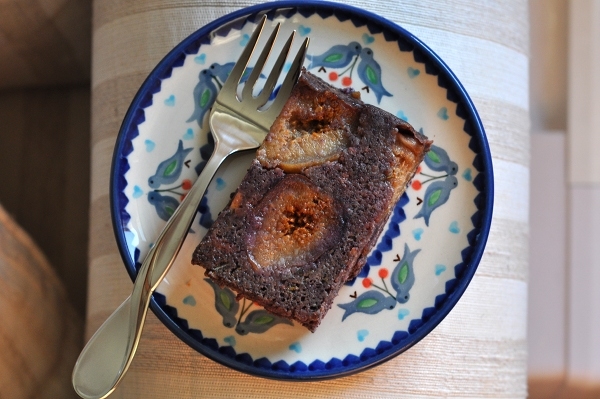 Pour batter into pan/skillet, distributing it evenly over the figs. Bake for 20-25 minutes or until a toothpick inserted in the center of the cake comes out clean. Allow cake to cool completely in the pan on a wire rack. To remove it from the pan, run a plastic knife or spatula around the edges of the cake. Place a tray, plate, or cutting board on top of the cake pan. Holding the edges, quickly flip the pan and the tray so that the tray is not on the bottom. You might need to shake the pan a little to get the cake to fall out but it should come out smoothly. 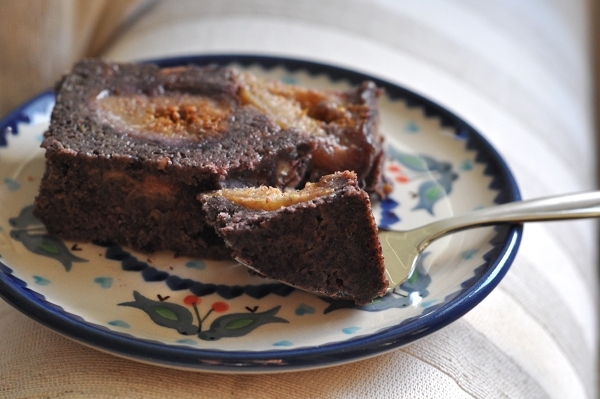 You might want to wait till shortly before serving it to invert the cake so it keeps that fresh, glossy look.